Stayed for three nights, room overlooking the canal... quite a small room, en-suite shower clean, hot and powerful enough.. Room clean and daily maid service. 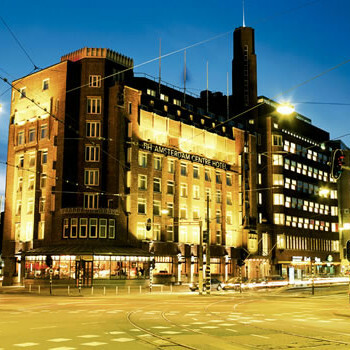 The Nh City Centre Hotel is a clean, well run hotel and is ideal for exploring Amsterdam being situated close to the city centre but on a relativly quiet street. Our room, which overlooked a canal, appeared to have had the bathroom added at a later date which made it an odd shape and left little room on one side of the bed but was fine for the amount time we spent there. The room and the public areas were kept clean and the staff were very friendly. Breakfast offered a good selection and there were plenty of tables at all times. There are lots of resturants and bars nearby, but we found that the Spui bar, a few doors from the hotel was really welcoming. I think that this hotel was very good the only downside was that the room we had on the 1st floor was smaller than the average hotel room, there was not alot of room to move! The staff were quite friendly and the location was o.k, it was close to everything and transport was good. I would definately stay there again. I have stayed in this hotel twice, once with a friend, and previously with my partner. Had breakfast on first visit and found it to be excellent. Room only on second visit (due to price). Location excellent, on Spuistraat, handy for shops and tram and Dam square. Room clean and adequate, although nothing fancy. I would go back again though.